The fundamental idea presented here is that of "rights." It is rights-consciousness, more than anything else, that is being appealed to. It is believed that Americans particularly think in terms of their rights, and are more ready to fight for the rights of the community than over any issues expressed in other terms. A "right" is not necessarily one that is actually obtainable under existing conditions. In fact, the very idea of fighting to get rights implies that, at least in some important respect, the rights people are entitled to cannot actually be had, and a change must be attempted so that they may be able to actually enforce and enjoy their rights. By the American conception of "rights," they are not mere privileges granted by permission of a government (which is the only way so-called European democracies can conceive rights) and which that government can therefore take away at its pleasure. On the contrary, a right is something inherent—whether given by a supposed creator (as the Declaration of Independence expresses it) or merely a direct result of one's physical presence in the Western Hemisphere, or whether it merely "grows," is unimportant; a government, according to the Declaration of Independence, and still more so according to the view of rights presented here, is totally subsidiary to the rights of the people. Thus, a suspension of citizens' rights during war for the defense of the government, is part of the caricature of "democracy" as found elsewhere; in America, though such a thing has been gotten away with several times, it has always encountered extreme popular opposition, and, according to the view of rights presented here, forfeits the government's claim to existence and constitutes a call on the people for a revolution. Anyone showing the slightest support towards a government which has shown any tendency to suspend the people's rights in its own defense, is a traitor to the liberties of the people, and without any qualification or exception being possible. A right, then, is something to which every individual in the community is morally entitled, and for which that community is entitled to disregard or forcibly remove anything that stands in the way of even a single individual getting it. 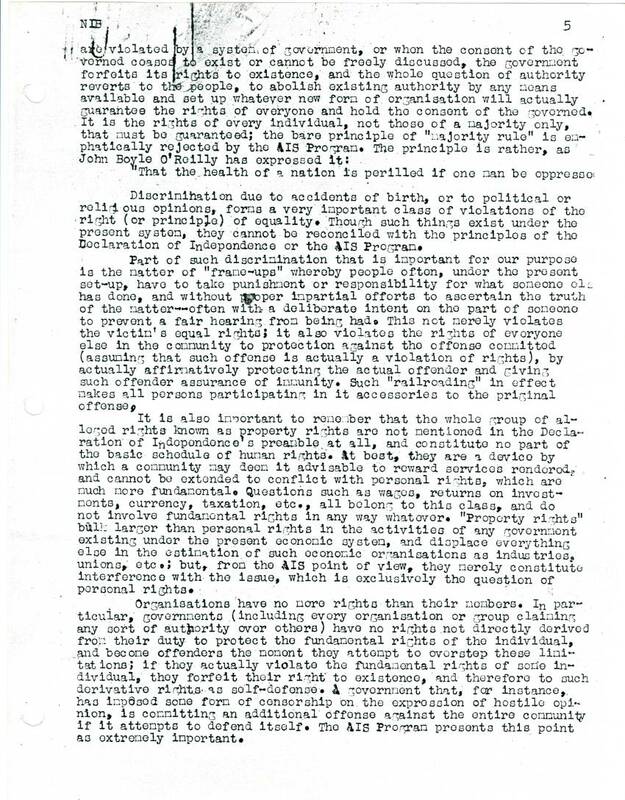 Rights belong to individuals, and no organisation has any rights not directly derived from those of its members as individuals; and, just as an individual's rights cannot extend to where they will trespass on another individual's rights, similarly the rights of any organisation whatever must yield to those of a single individual, whether inside or outside the organisation. And more than ever is this true of a government (which includes any form of organisation claiming power to control people or their means of living); for this form of organisation exists exclusively to protect the rights of everyone, and has no rights unless it actually does so. Rights―to sum up―primarily belong to individuals. A few rights are considered fundamental―these are enumerated in the Declaration of Independence as life, liberty, and the pursuit of happiness; this definition, however, is vague, and we attempt here to define further just what is meant. 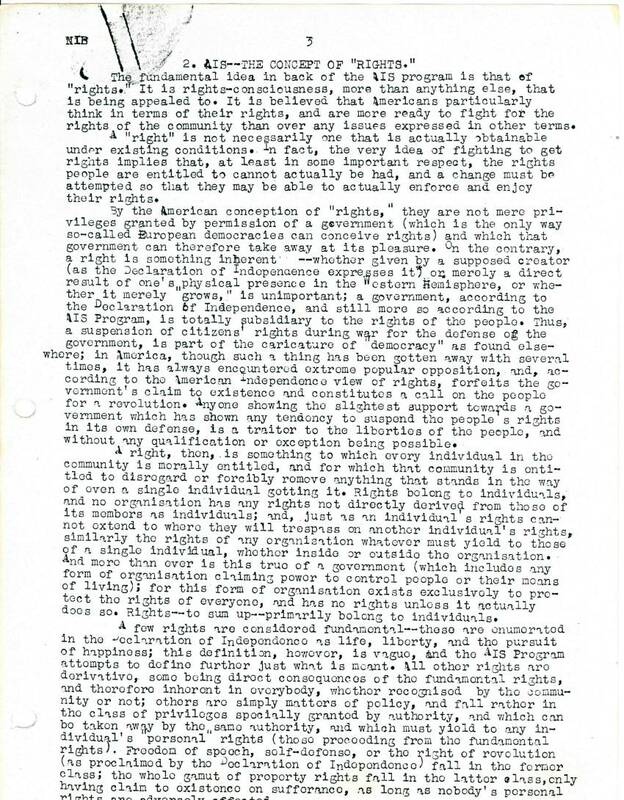 All other rights are derivative, some being direct consequences of the fundamental rights, and therefore inherent in everybody, whether recognised by the community or not; others are simply matters of policy, and fall rather in the class of privileges specially granted by authority, and which can be taken away by the same authority, and which must yield to any individual's "personal" rights (those proceeding from the fundamental rights). Freedom of speech, self-defense, and the right of revolution (as proclaimed by the Declaration of Independence) fall in the former class; the whole gamut of property rights fall in the latter class, only having claim to existence on sufferance, as long as nobody's rights are personally affected. "That the health of a nation is perilled if one man be oppressed." Discrimination due to accidents of birth, or to political or religious opinions, forms a very important class of violations of the right (or principle) of equality. Though such things exist under the present system, they cannot be reconciled with the principles of the Declaration of Independence or the views presented here. Part of such discrimination that is important for our purpose is the matter of "frame-ups" whereby people often, under the present set-up, have to take punishment or responsibility for what someone else has done, and without proper impartial efforts to ascertain the truth of the matter―often with a deliberate attempt on the part of someone to prevent a fair hearing from being had. This not merely violates the victim's equal rights; it also violates the rights of everyone in the community to protection against the offense committed (assuming that such offense is actually a violation of rights), by actually affirmatively protecting the actual offender and giving such offender assurance of immunity. Such "railroading" in effect makes all persons participating in it accessories to the original offense. It is also important to remember that the whole group of alleged rights known as property rights are not mentioned in the Declaration of Independence's Preamble at all, and constitute no part of the basic schedule of human rights. At best, they are a device by which a community may deem it advisable to reward services rendered, and cannot be extended to conflict with personal rights, which are much more fundamental. Questions such as wages, returns on investments, currency, taxation, etc., all belong to this class, and do not involve fundamental rights in any way whatever. "Property rights" bulk larger than personal rights in the activities of any government existing under the present economic system, and displace everything else in the estimation of such economic organisations as industries, unions, etc. ; but, from the point of view presented here, they merely constitute interference with the issue, which is exclusively the question of personal rights. Organisations have no more rights than their members. In particular, governments (including every organisation or group claiming any sort of authority over others) have no rights not directly derived from their duty to protect the fundamental rights of the individual, and become offenders the moment they attempt to overstep these limitations; if they actually violate the fundamental rights of some individual, they forfeit their right to existence, and therefore to such derivative rights as self-defense. A government that, for instance, has imposed some form of censorship on the expression of hostile opinions, is committing an additional offense against the entire community if it attempts to defend itself. The concept of rights given here presents this point as extremely important. See also poem by O'Reilly in America's Search for Liberty in Song and Poem.